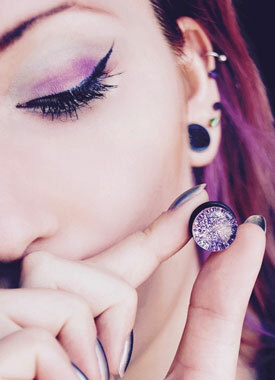 The idea of glitter plugs can be divided into two approaches. First there are ear plugs that consist of a sparkling front side (similar a picture plug). Second there are plugs with a liquid-filled void. The liquid is also enriched by glitter. While walking, the movement makes the plug and its included glitter shake and causing a flashy effect. Most items start at a size of 3mm a diameter. After you have decided for one of the alternatives you can choose between acrylic and surgical steel 316L. All in all these items can serve as stylish fashion accessories. As already mentioned we offer two different kinds of glitter plugs. The ones that contain liquid and the ones that don´t. This section of the article is about the ear flesh plugs containing glittery liquid. This special liquid is a transparent one and the jewelry itself is completely waterproof so that the liquid can´t drip out. This makes the glitter plugs we sell in our shop very durable. Inside the transparent liquid the glitter is placed. Our liquid glitter ear plugs are available in different colours like green, pink, silver and multicolour. The multicolour liquid plugs contain glitter in various different colours.